The main invasive diagnostic manipulations for breast examination conducted with imaging guidance (ultrasound or X-ray) are core needle biopsy, vacuum biopsy, fine needle aspiration biopsy (FNAB), and ductography. Core needle biopsy of mammary gland lesions is carried out with stereotactic X-ray accessory and special tools—a biopsy gun and guillotine needles for precise sampling sufficient for pathology. 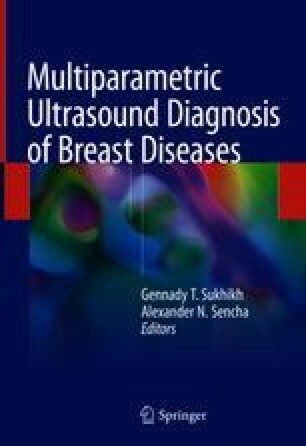 Puncture of breast masses under the control of echography, in combination with X-ray mammography, increases the detectability of cancer to 95–98%. FNAB with cytology is the least invasive and highly feasible method. It is the leading modality among the invasive diagnostic interventions for benign breast diseases. Ductography is the technology of X-ray imaging of artificially contrasted lactiferous ducts. Treatment of the breast cyst by puncture is sufficient in most cases. If the cyst is filled with fluid again, the procedure can be repeated or enhanced by one of the variants of sclerotherapy (destruction). Laser ablation, cryoablation, and other ablative procedures for solid breast masses have limited indications. Invasive interventions on mammary glands are highly effective and well tolerated by patients; nevertheless, they require certain indications, respect of contraindications, and strict adherence to the intervention technique.